You want to put your best face forward everywhere you go, but that is difficult to do when you have dark circles under your eyes. Discoloration of the skin under or around the eyes is a common problem that can be the result of allergies, certain medication use and the normal effects of aging. If you suffer from allergies, you may notice changes in the skin coloration around your eyes. These can range from dark circles under the eyes, known as "allergic shiners," to scaly, red, thickened skin on the eyelids themselves. The dark appearance comes from your immune system’s response to an irritant in the environment, leading to blood vessel dilation and increased blood flow under the skin. Scaly red skin is usually the result of a long-term allergy. 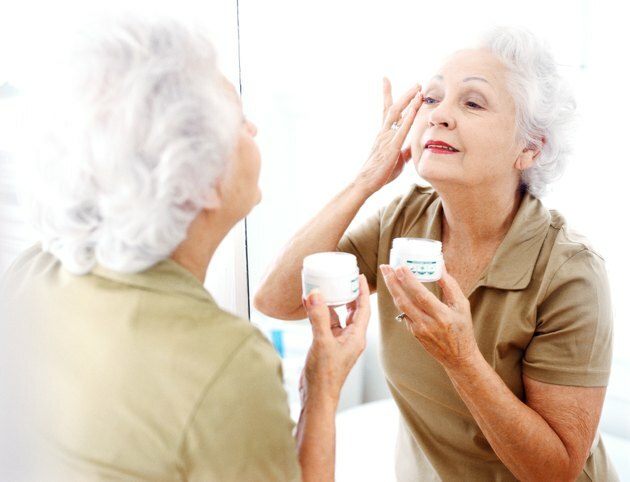 With aging, the lid skin loses elasticity and droops, creating shadows and a darker appearance around the eyes. Fat within the lid, which gives the skin around the eye its supple, youthful shape, thins out over time, giving the eyes a "hollowed out" look. This thinning of the skin also makes the blood vessels beneath more visible, contributing to the discolored skin appearance. Sometimes, discoloration under the eyes is hereditary. If this is the case, other family members will share a similar appearance. Eye medications, such as prostaglandin analogs, can cause darkening of the eyelid skin. These eye drops -- such as tafluprost (Zioptan) and travoprost (Travatan) -- are used to lower eye pressure in people with glaucoma. Bimatoprost (Latisse), a topical solution used to elongate eyelashes, is made from the same active ingredient as the prostaglandin analogs and can also cause darkening of the eyelid skin. Stopping these medications reverses the skin effects.